I will take a slight break from blogging, as today my Father-in-Law walked in with an Orion SkyViewEQ 8. It's an old one he got off a mate who wasn't using it any more. It has a CLOCK DRIVE!!! So although Hughie has relented, and rain is pouring down, I'll be setting up my new toy. So I'm off the air, sorry. I've uploaded a Celestia ssc file for the Gliese 581 system. Download it and put it in your extras folder and go exploring. UPDATE to the update: I've rejigged the files so there is more information, the info URL actually points to the right place and some of the orbital periods are slightly more accurate. Download the file Wolf_562.ssc (the alternate name for Gliese 581) and put it in your Celestia extras folder and go exploring. UPDATE: RomRod reminds me that new versions of Celestia have Gliese b. If you have a recent version, just comment out (put # in fromt of each line) the Gliese b entry in the ssc file. In Celestia, Gliese 581 is called by its alternate name Wolf 562. If you go to the menu item Navigation | Star browser you will find it lested as one of the top 150 closest stars. Wolf 562 often turns up in science fiction stories. 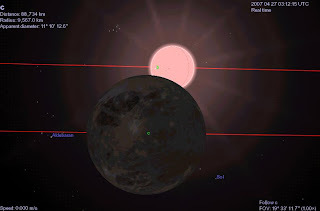 From Gliese 581 c's night side, Sol is part of Taurus. I've used the Ganymede texture for Gliese 581 c, as there is speculation it might be a relocated ice world, like Ganymede. Comet Al, who has been my mentor in handling STEREO images to find comets and asteroids (and who has been very patient with me as I have stumbled along), now has his own blog. Go visit and have a look at the gallery, it is well worth it. When I was in high school, my biology teacher asked us to imagine life of a tidally locked world. I had great fun, imagining the creatures that lived in the baking deserts under the perpetual Sun. The frozen wastes under perpetual night, and the twilight zones, where more kind conditions reigned. The report from the ESO of a world such as my high school project world, a tidally locked planet orbiting the red dwarf Gliese 581 20.4 light years away, has captured the imagination of many people (heck! Wikipedias fast! there are already entries for Gliese 581 c and Gliese 581 d). 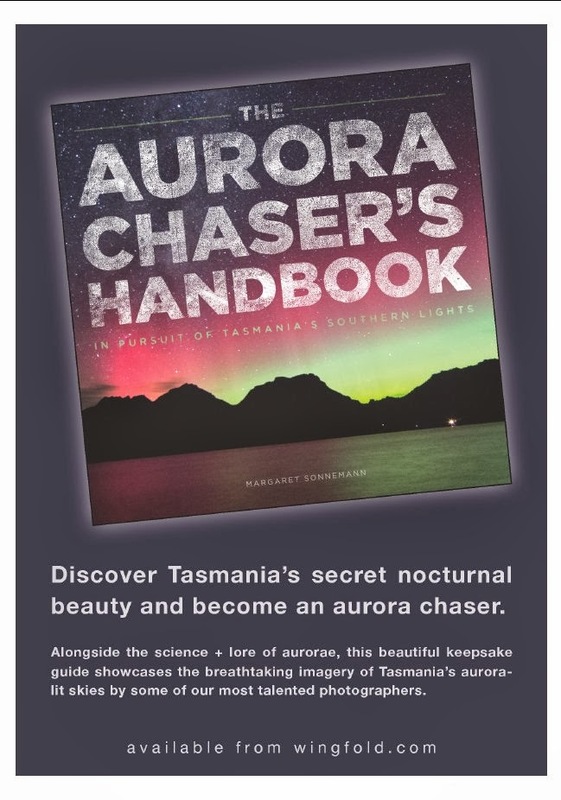 As well as the Bad Astronomer, Stuart and Tom discuss this find, each with a different point of view. What's more, it has turned up as major articles in the newspapers, the Australian, The Age and even the local Advertiser (no online story, sorry). 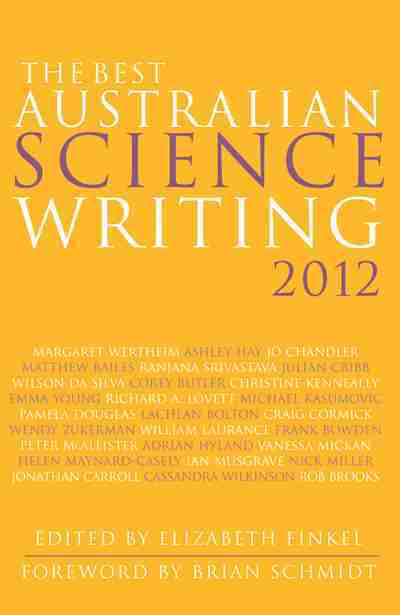 The journal Nature has a report, as does ABC science, and there is a video interview on Lateline. One thing that gets overlooked a bit is that the new planet is part of a solar system, there are three worlds in this system, a 15 Earth Mass Neptune-like planet (Gliese 581 b) and an 8 Earth mass planet (Gliese 581 d). 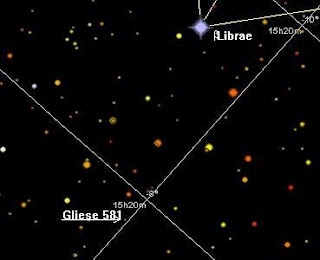 This solar system doesn't look much like ours though, Gliese 581 b screams round its Sun in 5.4 days, Gliese 581 c has a 12 day long year. But this is what makes this system so important. Most of the exoplanets seen so far are "Hot Jupiters". Massive worlds close to their Suns. Our current theories of planet formation say that these worlds form out beyond the "frost line", the distance from the Sun where ice forms, and then migrated inwards. In most of these models, any terrestrial worlds get ejected or consumed by the giant worlds. More recent models suggest that terrestrial worlds can re-form after the Giants move through. This finding of a terrestrial style world (1.5 Earth radii in diameter) outside a star hugging giant world suggests these models are plausible, and there maybe a lot more Earth- like worlds than we suspected around systems with hot Jupiters. The Universe has just become a more interesting place. I'll be making a Celestial file for this system soon. One of the themes of my blog is that you don't need fancy equipment to take nice shots of the sky. 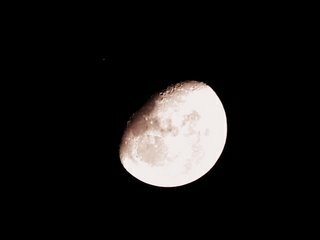 This very nice shot of the Moon was taken by Michael Whittaker of Lismore by holing his digital camera to the eyepice of his small reflector. His handheld shot of Saturn awasn't too bad either. Looking forward to seeing more of Michaels shots in the future. 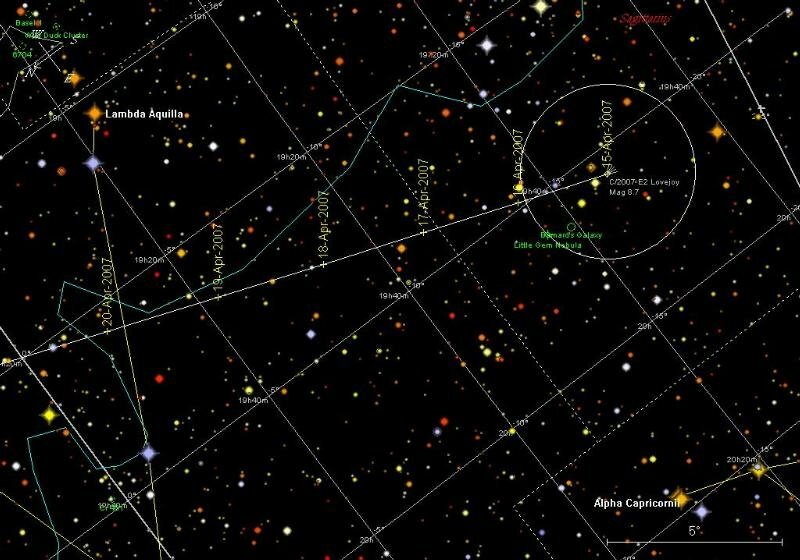 Has an Earth-like exoplanet been found? Run, don't walk, to the Bad Astronomer where he discusses the report from the European Southern Observatory on an apparent terrestrial planet around a red dwarf star. If this is confirmed, this wil be amazing news. The Hubble Space Telescope is 17 years old today. In commemoration, Hubble has released this astounding, breath taking image (click to enlarge, you won't regret it). For an instrument that has been sending back breath taking images, this one has surely topped the lot. The image shows a 50 light-year-wide view of the tumultuous central region of the Carina Nebula where a maelstrom of star birth – and death – is taking place. Stereo images of the Sun, cross your eyes to see the Sun in 3D (Image Credit NASA/STEREO). For the first time I've scooped someone. 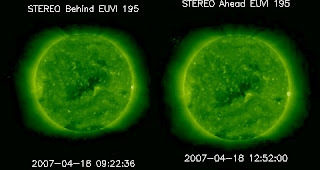 NASA just put out a press release annoucing the first stereo images of the Sun taken by STEREO. 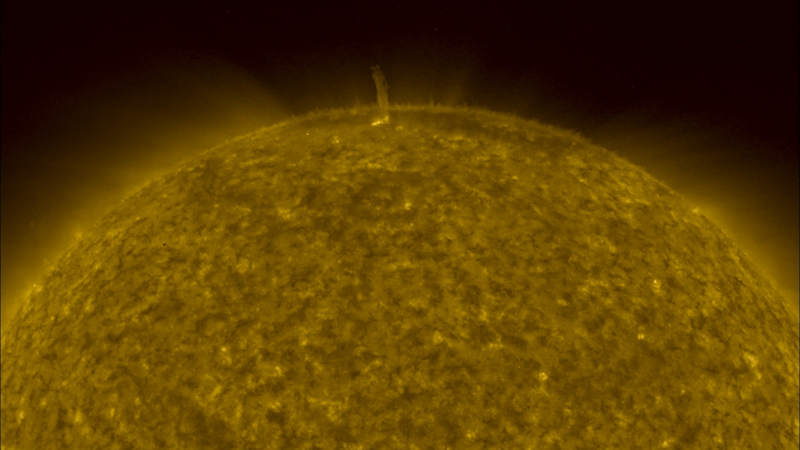 But I put up stereo imags of the Sun here and here last week! So I got there first! Mind you, NASA's images are a lot better, but most require red-green stereo glasses to see. However they are fantastic, go and see. Comet E2 Lovejoy at its brightest this week! UPDATE: I have produced black and white printable charts suitable for use in the field. here is the spotters map, and the binocular map. Comet E2 lovejoy is currently zooming through Aquila, it is currently about magnitude 7.6, easily visible with 10x50 binoculars (except in very light polluted areas) as, well, a fuzzy dot. But a fuzzy dot that moves signficantly from night to night. Heck, if you look long enough, you can see it move over the course of the morning. 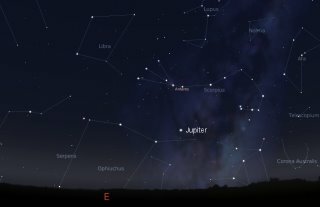 Lovejoy should peak in brightness around the end of this week. So the next few days, while the moon is absent from the morning sky, is the ideal time to look for the comet. Here is a high resolution view in the same orientation as the spotters map above. The circle is the field of view of 10x50 binoculars. Stars down to magnitude 8 are shown. 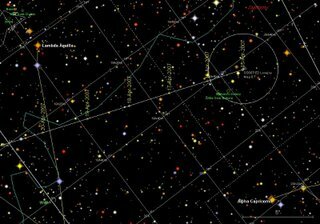 The comet is curently close to bright Zeta Aquliae, and should be easy to hop to from this star. 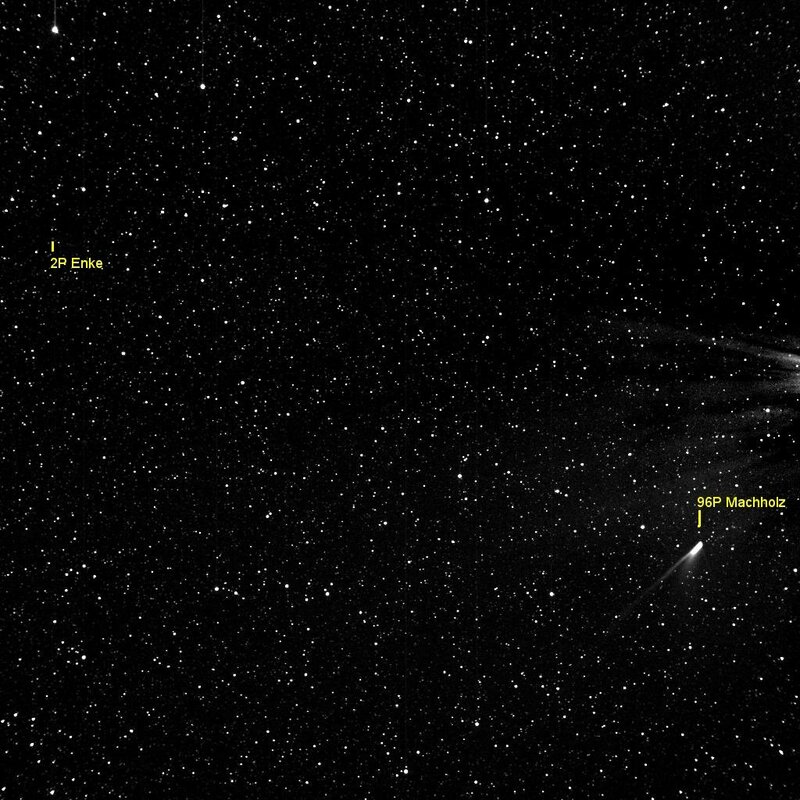 Here are some images of comet Lovejoy from Dennis Persyk, which includes a nice animation. But wait, the Australian ABC has out up its Summer Photos at Scribbly Gum. 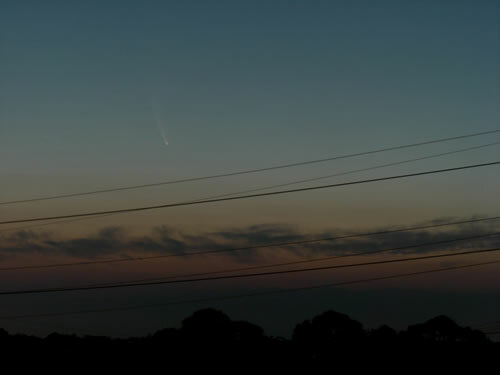 Comet McNaught photos predominate. Fellow SciNatterer Cynthia Ma has had an image published (middle in top row). The crescent Moon next to El Nath (beta Taurii), Venus and Aldebaran (click to enlarge) on the evening of Saturday 21 April above the Stringy Bark campground, Deep Creek conservation park. We just had a wonderful weekend camping. I missed the Friday lineup of Antares, Venus and the Moon, due to traffic issues making us late to the campsite. But that night the heavens spread above us in an amazing Jewelled carpet. One of the most startling constellations was the Emu, an Indigenous Australian constellation that consists mostly of dark nebula. It stretches from the Southern cross to past Scorpius. Most people are unfamiliar with it, but when it is pointed out, the dark star clouds forever more form an Emu. Saturday was a nice but strenuous walk down into Deep Creek, where wild seas meet an equally wild landscape. See the stereogram to the left I created of the headland (try centering on the pointy triangular bit in the middle then crossing your eyes, you may need to click to enlarge it). That night, tired but happy and scoffing down large amounts of spaghetti bolognaise, I caught the scene up the top with Venus, ALdebaran and the Moon (in the enlarged version you can just see the Hyades). Then the clouds rolled in. I had the film camera set up to photograph an iridium flare, the clouds broke at the last moment ... and so too did the cable release of the camera. I held the shutter open manually, but I'm sure the image will be too wobbly to be of interest. That said, the Flare occurred just above Saturn, and was very good to see, before more cloud blotted out the sky at last. Needless to say, I didn't get to see comet Lovejoy. But it was a wonderful weekend nonetheless. 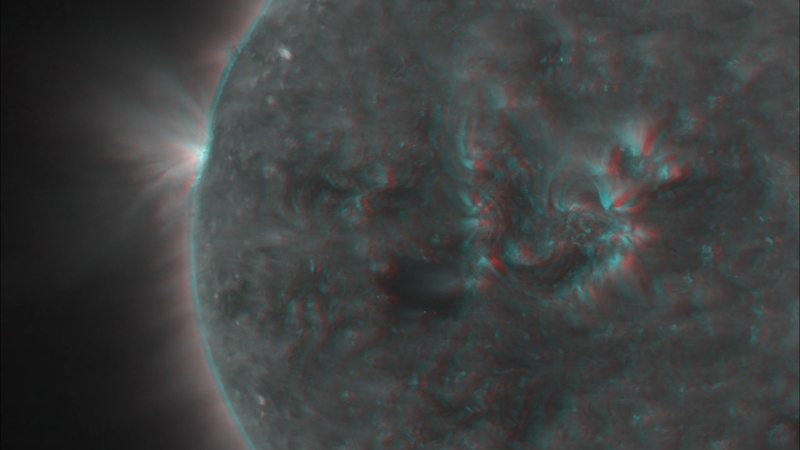 Here's another stereogram of the sun taken from STEREO images of the 26-03-07. Cross your eyes until the images align. You may have to click on the image to get the larger version. This is more exciting than the last one, nad has a more 3D feel. STEREO has other stereo sun imaging cameras, but a lot of the images are missing or incomplete. I'll have to do more of a serach. Cross your eyes, make the images of overlap and hey presto! The Sun in stereo. You may have to click on the image and get the full size version to do this effectively. Okay, so I have a STEREO obsession, but this is one cool satellite. 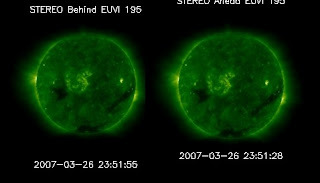 One of the reasons for the Launch of STEREO was to, well, image the Sun in Stereo. I have now just stumbled on the part of the STEREO Science Center where the actual Stereo images are kept. So I'm slow on the uptake, I'm sure lots of people have found this already and are making their own Solar Stereograms. Anyway, I coped the ahead and behind images, fused them into one graphic. I tried to align them and space them so that you get optimal "stereoness". I could do better, but not bad for a first attempt. Now I have to find an image with something dramatic happening. When patiently helping me out with processing Stereo images, Alan Watson gave me two challenges, in the images from Stereo H1a 0326 find a SOHO Comet and an asteroid. I thought I found the comet, but that turned out to be the asteroid, shown here with the yellow brackets. On Stereo image 20070326_232115_s4h1A.fts it is at 771, 114 (where 0,0 is the upper lefthan edge of the image, units are pixels). You can get the animation here (1.3Mb). Several days later I re-examined the images, and found the comet. 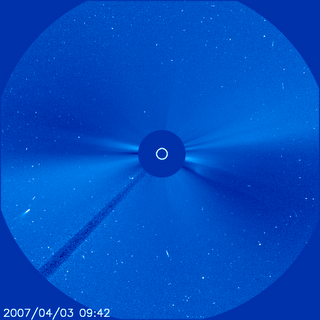 SOHO #1277 is in the lower image, again identified with the yellow brackets (it is also much fainter). The animation for that one is here (1.1 Mb). With both images you can click to enlarge them. I'm a bit pushed for time at the moment, but it looks like I'm going to have a lot more Stereo fun. Cardinal George Pell, Catholic Archbishop of Sydney, has a rather bizarre opinion piece on global warming in the Sunday Telegraph. I'm rather gobsmacked that a senior figure of any church seems to have been taken in wholesale by the Global warming deniers. Eh, what? Who has said this, certainly no climate scientist. Global sea levels will change significantly between 2040 and 2100. Just how rapid depends on whether the alarming increase in glacier movement continues and how much we can reduce our greenhouse gas emissions, but no one has claimed sea levels will rise spectacularly soon. A local newspaper editorial’s complaint about the doomsdayers’ religious enthusiasm is unfair to mainstream Christianity. Christians don’t go against reason although we sometimes go beyond it in faith to embrace probabilities. Neither should it be too surprising to learn that the media during the last 100 years has alternated between promoting fears of a coming Ice Age and fear of global warming! This takes the myth that scientists believed in a new ice age being around the corner, and makes it even more mythical! Now its the media that have been promoting global warming/cooling (what? alternately?) for a 100 years! Where did this nonsense come from? Did the Archbishop even talk to a climate scientist? How can he talk of reason with a straight face when he hypes myths to ridiculous levels? Lots of other denialist taking points are there as well, ice levels in Antarctica (and also here), satellite temperature changes, the lot. Over at Pharyngula and Recursivity jaws have dropped because Archbishop Pell invokes Noah's flood, (to be fair, he may be thinking of the prehistoric Black Sea flood), but really, the whole thing is such a farrago of nonsense and poor logic that it mocks his claim of not going against reason. Again, why can't people talk to actual climate scientists before spouting nonsense. More fun things you can do with the data from Stereo. 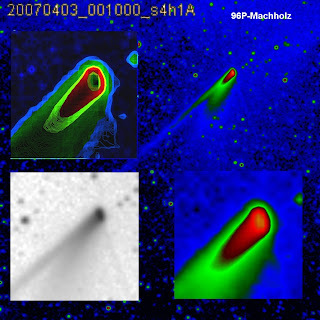 These are images of comet 96P Machholz caught in the H1a camera of Stereo produced by Alan Watson. They have been processed in false colour to bring out come features of the coma and tail. But they are also gorgeous to look at, true comart. Venus and the Crescent Moon above the north western horizon as seen from the southern hemisphere an hour after sunset (click to enlarge). 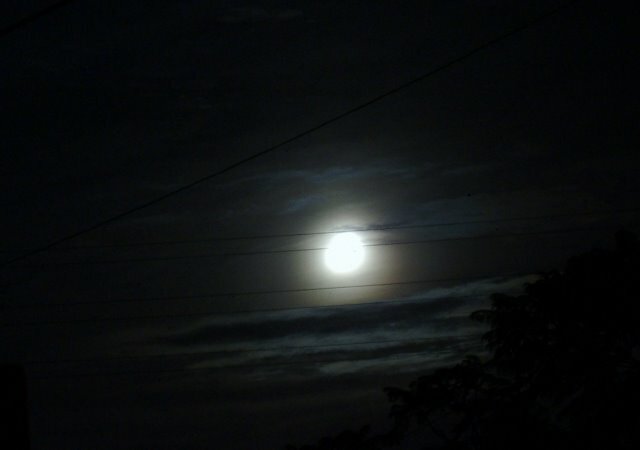 On Thursday and Friday the Moon reappears in the evening sky. 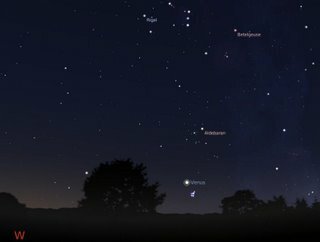 Thursday you will require keen eyes, a level unobstructed horizon and probably binoculars, as the very thin crescent Moon is just a few degrees above the horizon half an hour after sunset. But on Friday, there is a lovely lineup with the Crescent Moon, Venus and Antares. Worth a pciture I think. While waiting for Fridays event, watch Venus glide under the Hyades (the V shaped group of stars with Alderbaran at one end) over the next few days. I told you I felt an animation coming on. Here is my animation of Venus catching up to the Pleiades between 3 April 2007 and 10 April 2007, as seen throught the H2A camera of STEREO. Venus is a long streak because of saturation of the camera sensors. The Hyades and Alderbaran are near the bottom. The resolution on this one is a bit worse than the original AVI (1.7 Mb), what do you folks think, YouTube versions or stick to links to download AVI/GIF/MOV files?. Map of the location of comet E2 lovejoy (click to enlarge to useful size). 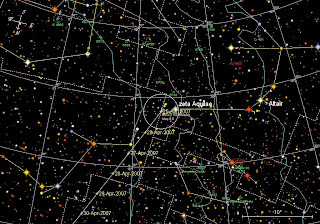 The comet is visible in Sagittarius, but is just above alpha Capricornii, of Capricorn. Stars down to magnitude 9 shown, the circle represents the field of view of 10x50 binoculars. 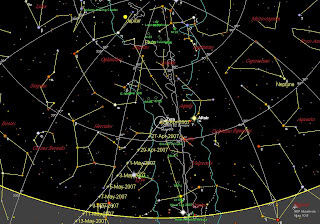 Capricorn is in the eastern morning sky (see Charts here). 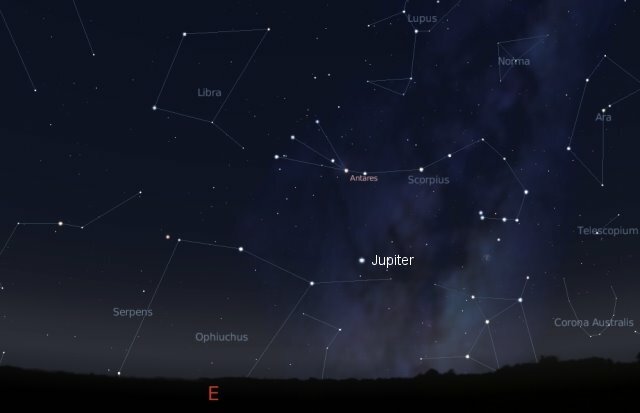 You have to get up around 3-4 am in the morning to see it, but comet Lovejoy is currently brighter than Magnitude 8, meaning you can see it as a small fuzzy dot in 10 x 50 binoculars, under darks sky and most suburban locations. 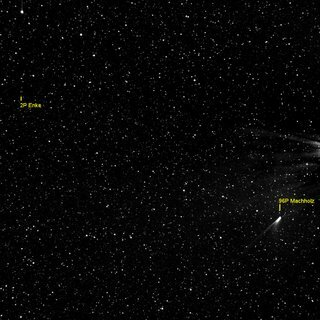 Images of the comet by Dave Herald are here, and a Spanish group here. Here is another perspective of the Venus- Pleiades thing, as seen through the H2a camera of the Stereo spacecraft on the 3rd of April, which is why the positions of venus don't match up with my previous post (the comet animations I did were from the H1a camera). I feel another animation coming on, but I'll do that tommorow. (The long elongated streaks are side effect of over saturation of the sensors, the bright long streak near the bottom left is Venus). What I was searching for was a different camera view of Comet Macholz, to see if I could get it in stereo. But the Ha2 and H1+2b cameras are pointing nowhere near the field of view of H1a. So much for that idea. But I have other things to play with now. 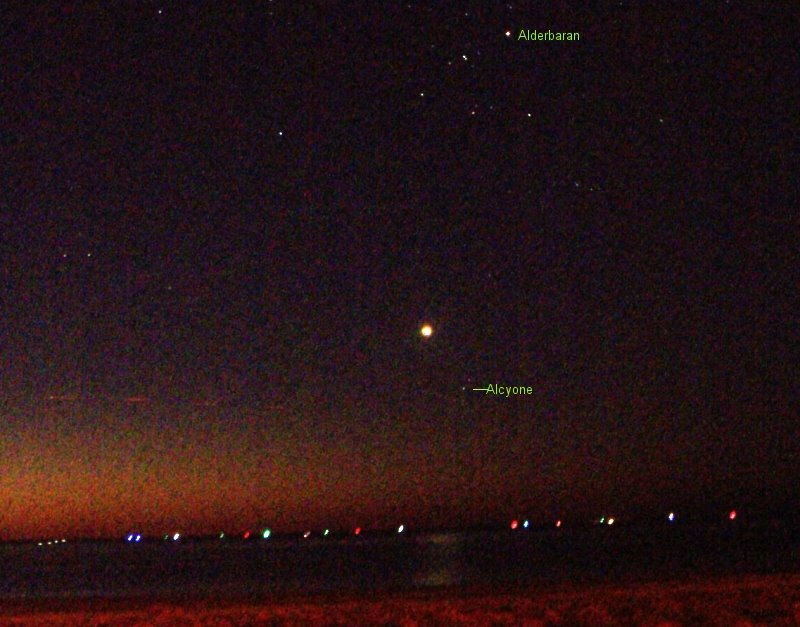 Venus and the Pleaides on the 12th of April. Again you have to click on the image to see the the stars of the Pleaides I captured (Electra, Alcyone and Atlas), but this time you can see the reflection of Venus in the sea clearly. Stack of 5 images, images background subtracted and Max-Min adjusted in ImageJ, stacked in The Gimp. There's lots of cool blogworthy stuff at the moment, I'll try and get onto it this weekend. Venus, the Pleiades (sort of) and the Hyades above the horizon at 7:00 pm ACST, 11th April. 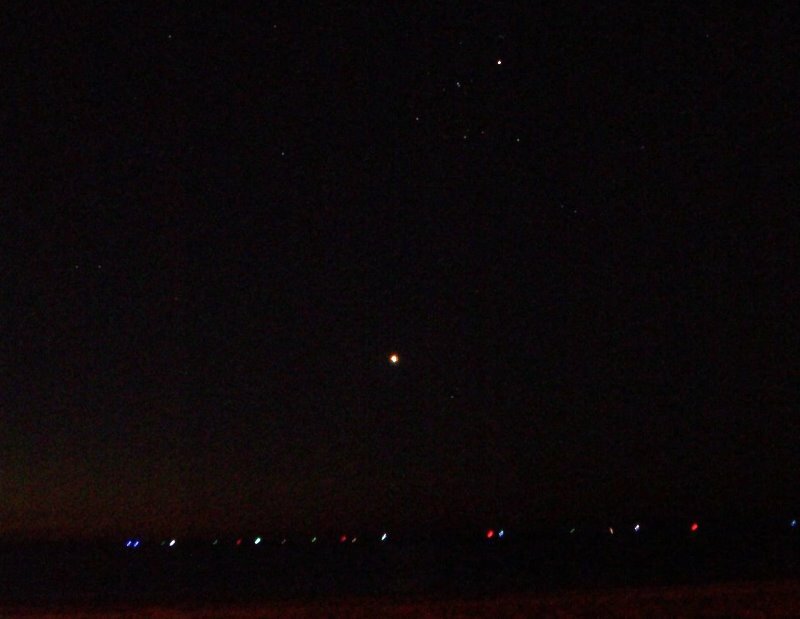 You really will have to click on the images to get the full sized version to see the Pleiades. 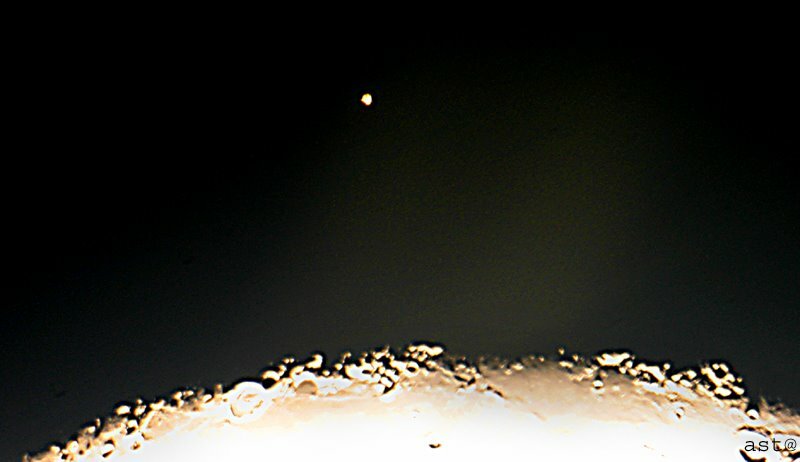 Even then you can only see Alcyone, Atlas and very, very faintly, Electra (to the right and slighly down from Venus, the brightest object in the image, Alderbaran and the V shaped Hyades are up the top of the image). If you look really hard, you can even see the reflection of Venus on the water. I was a bit dissapointed that the rflection didn't come out, it was so clear to see. Tommorow I'll try taking the images about 15 minutes earlier, and see it that makes a difference. 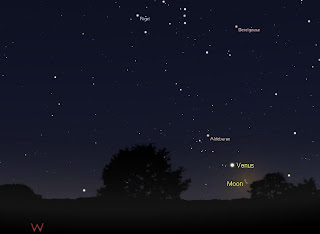 How did everyoneone elses Venus and Pleiades viewing go? 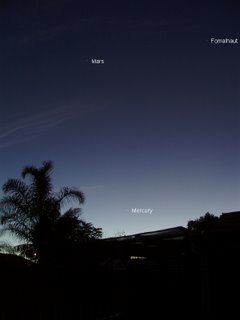 Mercury is lower in the sky, but still obvious in the early morning along with Mars. This image was taken at 5:48 am ACST, and Mercury was much more obvious than this image implies (you have to click on the image to see the dots that are Mars and Mercury). So if you haven't had a look for Mercury yet, have a look in the next few days. You really will have to click to enlarge this one to have a hope of seeing anything. 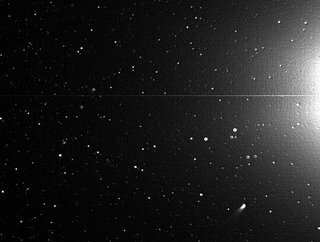 I mentioned earlier that the recent (April 6) Stereo images had both comet 2P/Enke and 96P Machholz in them, but I couldn't find Enke. 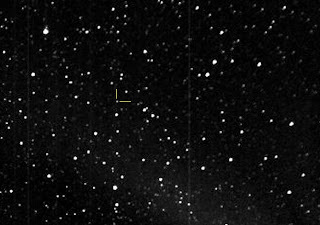 Well, you can't see it in the raw images, and even a highly processed image shows it as a tiny dot, compared to Machholz, which looks like a comet. I have an animation of Enke here (0.1 Mb). You have to look carefully at the lower lefthand edge of the animation to see the faint dot that is Enke scream along. I have some new animations of Machholz as well, with better processing. An AVI (2.3 Mb, good definition) and a quicktime file (61 Kb, so-so definition). The images are a lot better this time thanks to Alan Watson and the other good folks at Comets-ML, who talked me through processing Stereo images and locating Enke. Many thanks guys and gals for your help and patience! 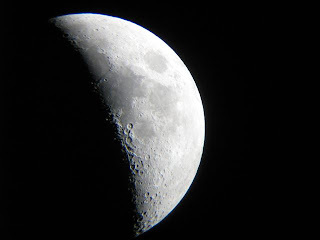 Even though I missed imaging the occultation, lots of other people didn't. First up is Tony Travaglia, of Omaru, New Zealand. Several of his pictures have graced these pages before. Here he has caught Antares shortly after emerging from behind the Moon. He had cloud problems too, but the clouds celared just before the occultation (click image to enlarge). Next up is Chris Wyatt from Bendigo Victoria. taken with Canon PS S2IS (12 times optical zoom, 50 ASA for 1/8 sec).Highly processed to get best of both Moon & Antares (above & left of Moon, click to enlarge). Venus and the Pleiades as seen above the western horizon at 6:45 pm ACST from Adelaide on April 12 (similar views will be seen in the southern hemisphere at equivalent local times), click to enlarge. From the 10th of April to the 13th of April, Venus will visit the beautiful star cluster the Pleiades. Venus is closest on the 11th and 12th, when it is just a fingerwidth away. 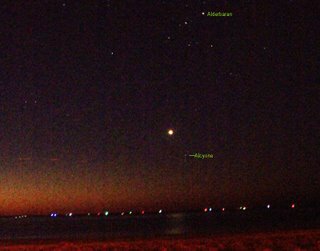 Unfortunately, Venus and the Pleiades are very close to the horizon when the sky is dark enough to make out this faint cluster, so you will need a level, unobscured western horizon (like a beach), and there will be a very narrow window to see it. 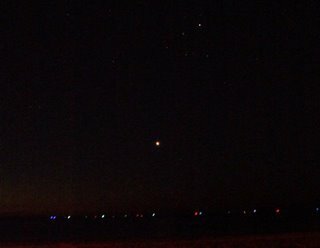 Last night Venus was brilliant, and I could see its reflection the the water, but the Pleiades was hard to see through the horizon murk (made a great sunset though). Binoculars may be a help. 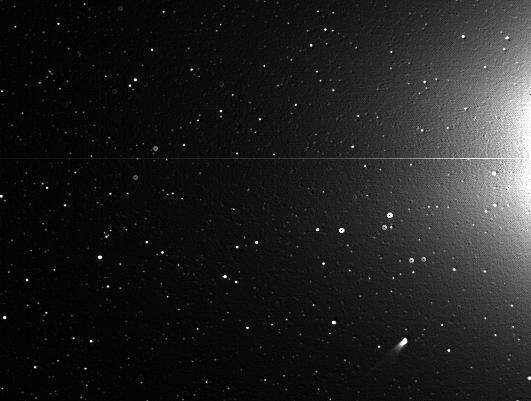 Comet 96P/Machholz was in view of the SOHO cameras last week. Now it is in view of the STEREO H1A camera. This image is an overprocessed version of the original Stereo fts file. The comet is lower right. Here is an animation based on the unprocessed files. As I wort before Machholz will be a bit of a bust for southern viewers. However, 2P/Eneke will be a nice binocular object. 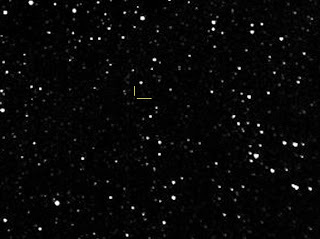 It is currently also in the Stereo cameras as well, but very faint. My old nemisis cloud got in the way of the occulation of Anatres, almost. I set the sccope up to try and image the occultation, but it became rapidly clear that any point within spitting distance of a power point to run the camera would have the Moon blocked out. So I quickly set up a camera and tripod, set up to take shots, then wipped out the binoculars. I did indeed see Antares emerge from behind the dark side of the Moon moments after going binocular, then the cloud closed in completely. The digital camera just recorded cloud diffused light. Not bad, but I wish I had done the binocular set up earlier. The April edition of Southern Skywatch is finaly up. Sorry for the delay, family Lurgi and all that. We have an occultation of Antares on Saturday April 7, Venus close to the Pleiades and some nice Moon encounters. Not to mention Comet 2007/E2 Lovejoy, visible in binoculars now. Saturday April 7, Occultation of Antares. Eastern Horizon as seen from Adelaide at 9:30 pm ACST, click to enlarge. 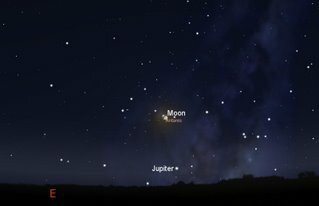 There is an Occultation of Antares by the Moon on Saturday April 7. This is visible in New Zealand, Central and Eastern Australia. In Eastern Australia, Antares passes behind the bright limb of the Moon shorthly after Moonrise, in Central Australia the Moon rises after Antares has gone behind it. In New Zealand, the Moon is a decent height above the horizon before Antares disappears. Antares emerges from behind the Moon at (local times) 21:10 Adelaide, 21:26 Brisbane, 21:39 Canberra, 21:43 Melbourne, 21:36 Sydney and 23:41 Auckland. Full occultation start and stop times are at Southern Skywatch now. Antares is bright enough so it can be readily seen with the unaided eye against the Moon, although binoculars or a telescope will give a better view. Seeing Antares "pop out" from behind the dark side of the Moon is pretty groovy, so why not have a look? ...Like I did. Go here and download it now, gavity waves, aliens and exploding stars. What more could you want? 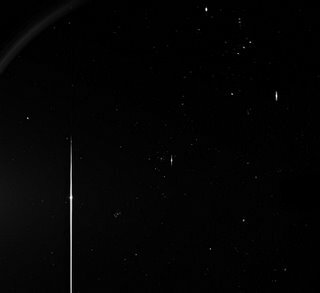 New Horizons, Io and Europa. Comet 96P Macholz in the SOHO C3 camera (image credit NASA/SOHO). The comet is the elongated fuzzy streak at lower left of the SOHO image. Comet 96P Machholz is a periodic comet with an orbit of roughly 5 years. This return it looks like Machholz will not peak much more than magnitude 3. From the Southern hemisphere the view of Machholz is poor. It won't be visible after civil twilight until around April 14th, when it will be around magnitude 8, very difficult to see in the twilight. However, orbital elements are here. 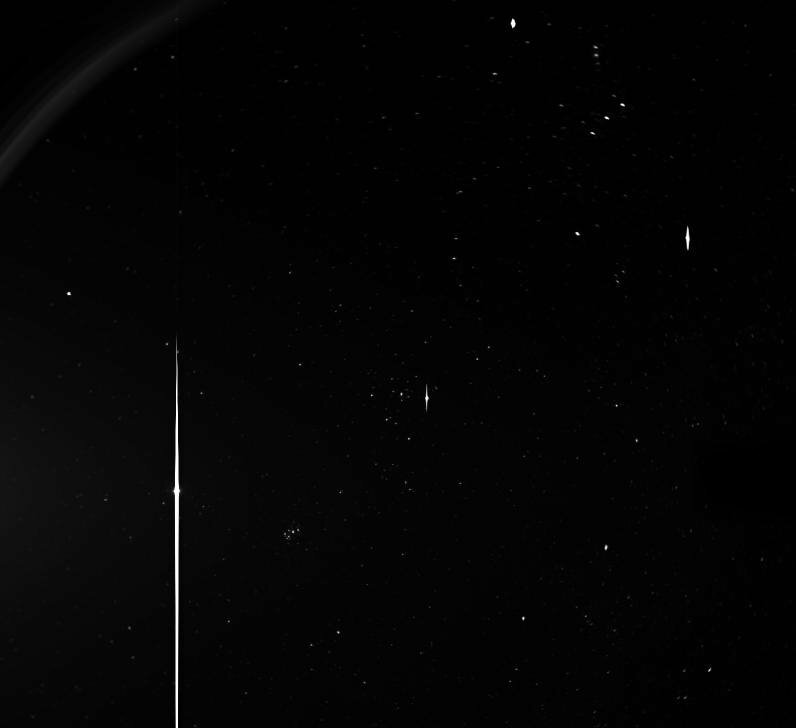 An animation of the comet entering the C3 camera field of view is here (warning 2 Mb). Otherwise, watch the YouTube version below. There is a nice flare about half-way in, then the comet appears low on the bottom left hand edge. Is there a better way to spend Saturday? Middle one turned 10 on the weekend (well, in base 8 anyway, in base 2 he is 1000). 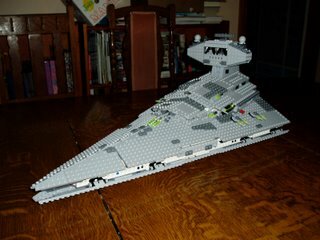 As part of the festivities and frivolity he got a Lego(r) Imperial Star Destroyer. From 10 am to 8 pm (including beaks for lunch, dishwashing and dinner), we worked on this together, solidly (occasionally "assisted" by Smallest One). We completed it together. It is awesome. It opens, it fires missiles, it launches an escape pod. Talk about father son bonding. Now the Bettdeckererschnappender weisle and I have come down with the Lurgi (actually, Lurgi's, different ones for each of us of course), so Southern Skywatch isn't up tonight. But we completed the Imperial Star destroyer. 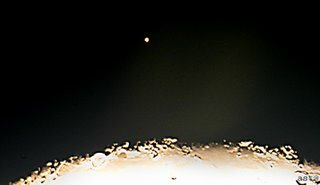 There are some nice images and animation from 2006 VV2. Here's a nice animation from Carey Johson, another nice animation featuring M81 and M82 (6.2 Meg) from Robert Long, and a good trail here and here. Space Weather has a stereo image of the asteroid as it goes past M81. Over at Ice in Space there is currently one image from Australia.